Reports are now coming in on the Society forum regarding the battleday held at Bletchley over the weekend. Montaperti was the battle of course, and information (Richard Lockwood's battle pack) on it can be found here. Photo from Phil Steele's Ancients on the Move blog. Well that was another Battle Day. I think it was a good day's gaming, we had seven games going, so a little down on previous years but that is probably down to my choice of a (to UK gamers at least) "non-mainstream" battle. So a little self-indulgence on my part this year! I got the sense that all the games were enjoyed by the players. That may sound a bit of an obvious thing to say, but what I am trying to say is the games seemed absorbing and challenging. So I take from this that the choice of battle was a decent one despite it not being well known. 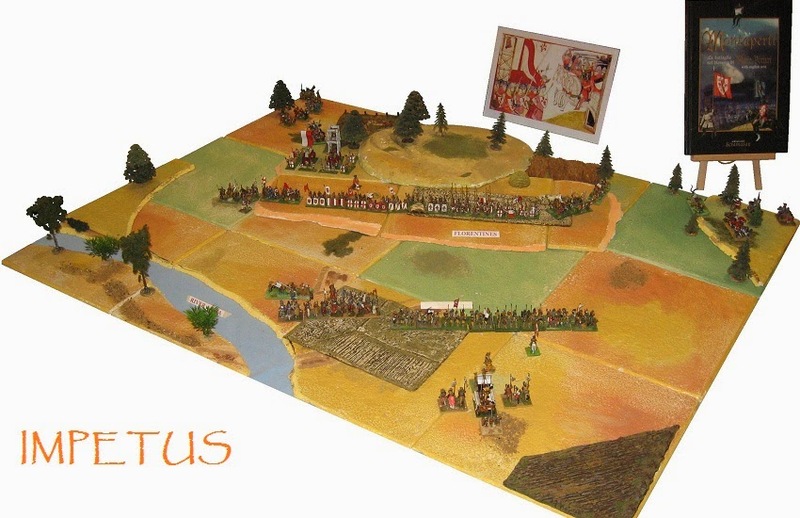 Many richly-deserved prizes were won - among which Best Terrain was a hard-fought duel between Pete Kershaw's DBMM terrain and Mark Craddock's Armati terrain. This year the prize went to Pete Kershaw's DBMM terrain. Overall Best Game went to Phil Steele's set up, using Impetus rules, beautifully-painted 15mm figures with hand-painted banners, and effective terrain. I am hoping we get good write-ups for Slingshot - I think the way people approached this battle will be very interesting. The smaller number of games didn't, to my mind, detract from the experience - and at least there was a bit more room to move around between the tables! Peter's prize for the terrain was well deserved: I loved the detail he'd put into it. Just a quick note to thank all and sundry for making it such an enjoyable day.... It was all jolly good fun which, I suppose, is why we bother! I'd like to echo the previous comments about the terrain on show, top form all round. It really adds to the immersion of the experience when the board looks good. And Phil Steele (who supplied the photo above) has posted pictures of all the games on his blog here. The battle for next year has also been announced, and it is Hydaspes. Time to get painting some Classical Indians!